The next time you stop and smell the flowers, you may want to taste one too after you read about these edible beauties. You probably already knew that flowers are used to make teas, but believe it or not, flowers can also be eaten. The edible nature of flowers has been known for a long time. In Medieval Europe, edible flowers were often used in meals. Today, edible flowers are becoming popular once again by upscale restaurants and caterers; however, you don’t have to eat out to try edible flowers. Many of these tasty treats can be found on your lawn or in your garden. I think flowers add an element of surprise and a great deal of beauty to everyday fare. Before eating any flower, I can’t stress enough how important it is to be sure of a plant’s identity-only certain flowers are safe to eat. Eating the wrong plant or flower can make you very sick or even kill you. Also, some edible plants have certain parts that are poisonous. Be careful to only eat flowers that are free of pesticides or other chemicals; for example, it is not a good idea to eat flowers from garden centers, roadsides or someone else’s lawn. Do not eat large amounts of flowers until you know how they affect you. Use flowers that are in their prime, and remember to wash and dry them before eating. Crystallized flowers, also known as candied flowers, are a great way to decorate cakes, cookies, cupcakes, and other sweet treats. They were quite popular in the Victorian era and are making a comeback today. To make, use edible flowers with a sweet, green taste such as roses, violets, pansies, violas; in some flowers, such as roses, only the petals should be consumed; in others, such as violets, the entire flower can be eaten. Beat one egg white or one powdered egg white-the powdered egg white eliminates the risk of salmonella. Then, use a brush to paint each petal or flower with the egg white. Sprinkle sugar over the edible flower, then let it dry on waxed paper. Use the flowers right away or store them for later use. I have seen some gorgeous wedding cakes decorated with crystallized violets and pansies. 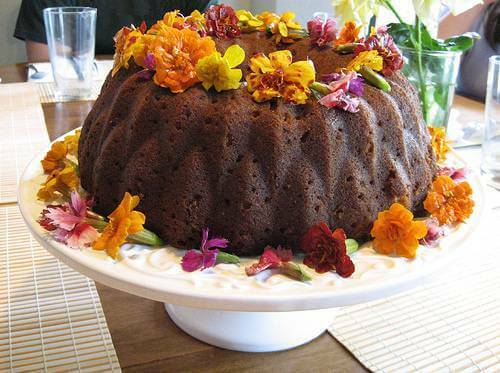 There are a variety of desserts that incorporate edible flowers. One such recipe is lavender cookies with lavender frosting, which is listed in one of the links below. 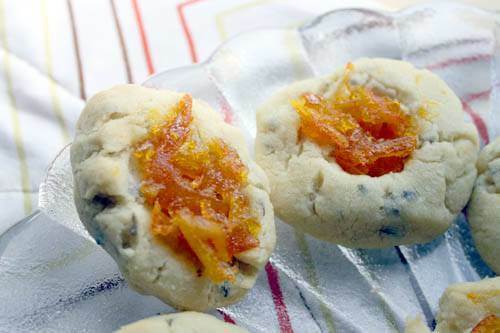 These cookies are very similar to sugar cut out cookies except they include ground lavender flowers. I have tried them, and I have to tell you they smell as heavenly as they taste. My whole house was perfumed with lavender as they baked! Jellies, granola, ice cream, and cupcakes are some other sweet treats that can incorporate sweet tasting edible flowers. Salads are an easy way to incorporate fresh flowers into your diet. 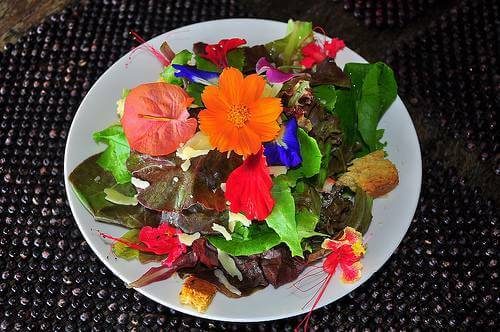 Simply pick the flowers you want, wash them, and place them in your salad to add flavor and color. I have listed some edible flowers appropriate for salads along with their flavors below. I often add flowers to my salads in the summer. They never fail to impress guests and they are a great conversation starter. I’ll bet you never thought there was a use for those pesky dandelions growing on your lawn. This weed actually can be used in a multitude of recipes. Dandelion pizza and dandelion fritters are just two meals that can be made with dandelion blossoms. To make dandelion pizza, just make your pizza as usual and add sautéed onion, garlic, dandelion blossoms, and dandelion greens to the top. Bake for eight to ten minutes. To make dandelion fritters, you will need two cups of dandelion flowers, one and one fourth cups of flour, one egg, and one cup of milk as well as oil or butter for frying. Combine the flour, egg and milk. Heat the oil or butter in a skillet. 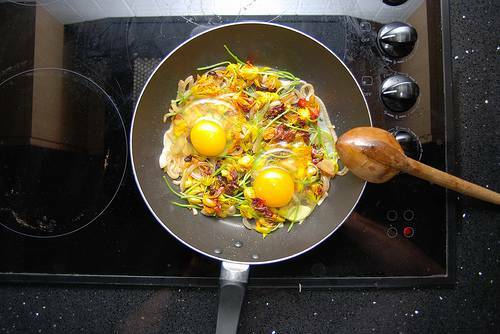 Dip the dandelion flower heads into batter, covering them and then lay in the skillet until done to your tastes. These fritters are great for breakfast with syrup or honey. Another floral breakfast food is the flower omelet, which is made simply by incorporating fresh edible flower petals into your omelet mixture.